Hamilton's first Automatic models arrived on scene in 1954. They had several of them, including their first calendar watch too. They were all members of the newly created K-series. One of them was the Automatic K-550. Also offered in 1954 was the K501 and K502 so it sort of begs the question, why the K-550? Why not the K-503? Well, there was a K-503 already in the works, and a K504 too. They came out in 1955. So the answer to "why the K550?" is... I don't know. Typically when the second digit in the model number is a 5, it means the watch has a stainless steel back. The first digit represents the bezel material... 1 is solid 18K, 2 is solid 14K, 3 is solid 10K, 4 is Gold Filled, 5 is stainless steel and 6 is Rolled Gold Plate RGP. So naming a first year model the K550 is a bit of a mystery. Like most of the K-series models, you can expect to see a 17 jewel 661 movement inside. My project K550 watch came with what I believe to be the original bracelet. The K550 is a one-year wonder, it was only produced for a single year. The catalog says there was a bracelet but it only shows the strap in the catalog. However I have it on good authority that this bracelet is correct. If the dial looks familiar, it should. The same dial was used in the 1955 K504. The shape of the lugs is what makes the K-550 different from the K504 - although the K504 has another dial pattern too. The case back unscrews. This is my favorite design for a case back - as I find it easy to open and close without my case wrench slipping. I've restored lots of K-series models and the 661 is a very familiar movement to me. It's a very sturdy movement but that makes it a very thick movement too. 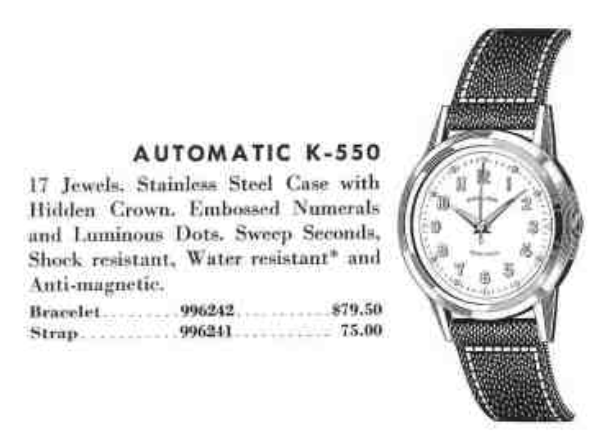 So the K-series eventually yielded to the Accumatic line, which was considerably thinner. And the Thin-o-matic line was even more slender, as you would surmise. Without the rotor assembly, the watch looks like your average manual winding movement - and it runs just fine this way too. It's not unusual to find automatic watches that are missing their rotors. They don't wind automatically but they still work and look just fine. According to my timer, this 661 gets a clean bill of health. Everything looks great. One of the reasons why the K550 was a one year wonder is the sleek design. Maybe it's a little too sleek. Where's the crown? It's there, but it's just recessed into the side of the case. So this watch is very hard to wind manually. It can be done but it's more challenging than when the crown is a little more exposed. This K550 is a sharp looking watch and you'd be hard pressed to find a nicer original example.